How many decisions have you made in the last year that have had a ripple effect through your business and/or family? When making these decisions, without a philosophy for ownership, you are left to guess, rely on gut feelings or hope that decisions you make are aligned with the wishes of the ownership. When you have a philosophy that guides major ownership decisions it can help minimize risk and maximize opportunity for your family and your business. ● What does it take to be an owner of the business? Do you have to be a certain age? Do you have to work in the business? Do you have to lead the business? Do you have to buy stock or is it gifted? Can step-children or adopted children be owners? Can spouses be owners? ● Do you have requirements for family members to work in the business?Do they need a certain level of training or education? Do they need to work elsewhere before they work in the family business? Do they need to get a promotion at another business before joining the family business? ● What is your ownership approach to growth and profit? Are you aggressive about growth or more moderate? Do you have certain expectations for profit? Do you expect distributions for owners? Do you expect profits to be invested back into the business? ● How do we make decisions as an ownership group? Do we have a board of advisers or directors? Do we have a family council? Do we vote on decisions? Does the majority stockholder make all decisions? The answers to these four questions will guide your business decisions. How do you determine your ownership philosophy? Ideally you set aside a full day with all owners of the business. Spend some time on your own answering what you think the answers to these four questions should be. Then answer the questions one by one by discussing and debating them until you come to agreement. Share your decision with the leaders of your family business, next generation family members and future owners. One note, if you first determine your ownership values and the legacy you want to build, the answers to these questions will become more clear. Schedule a full day to meet with all owners of your family business. Discuss and debate your ownership philosophy until you have answered all four questions. Share the answers to these questions with family members, leaders of your business and your advisers so you can create appropriate documents. Reach out to me, Sara Stern, at sara@familybusinessmn.com to help you get started. Not much about business succession is easy. There are decisions to make, risks to take, people to prepare, plans to share. An often overlooked part of succession is the practical, simple and often emotional question of what will the founder or leader do when the business is sold or transitioned to the next generation of leadership. This is one of the most powerful questions you can answer for yourself, as an owner. While it is simple, it is rarely easy to answer. When you know the answer to that question you can make better decisions, have more clear timelines and can communicate plans to the next generation that help them make better decisions. Fill it out with the names of current ownership, future ownership and your key leadership. Put everyone’s current age (including yours) in the first column. Then add 5 years to that age three times. This will help you see where you and all of your most important people will be in 15 years. It is incredible how quickly a 5 year old turns 20 years old when you do this. How do I want to be involved with the business in 10 years? What do I think the other owners, future owners and key leaders will want to be doing in their lives and careers. Will they be joining the business, retiring, hoping to have greater responsibility? What do I want my life to be like in 10 years. What time do I want to wake up? Where do I want to be living? Who do I want to spend my time with? What do I want to do on the average day? What do I want to be thinking about? What do I want my days to be like from the time I wake up until I go to bed? When you’re clear about what you want your life to be like write down a few key bullet points that describe what your plans are. Share that information with other owners, future owners and key leaders. Work together to make a plan for succession that gets your life to look like you want it to in 10 years. One third generation member of a family business did this and realized they wanted to be done working in the family business but still wanted to pursue their own entrepreneurial endeavors. They worked with the leadership and family to create a succession plan that allowed that to happen. While challenging, this is a truly valuable tool. Many family business owners are so busy running their business and taking care of their family that they don’t have time to sit back and think about the legacy they are trying to create. This can be dangerous for the family and the business. When you know what your legacy is, you make stronger decisions as a family, as owners and as leaders of the business. Often first generation family business owners are founders who have spent their time growing the business and haven’t thought about the legacy they are trying to build. It is important to spend the time determining what your legacy is so you can make better decisions about the transition to the next generation. Many second and third generation family members are so focused on continuing the hard work of previous generations that they don’t step back to think about their own legacy vs. their parent's or grandparent’s legacy. For all generations, decisions about who runs the business, how the business is run, ownership structure, estate planning and decision making are easier when you’re clear about the legacy you’re creating. Schedule 3 hours with all owners of the business and answer two questions. Your legacy is the answer to the questions. The first questions is why do we continue to own the family business? Ask yourselves why you continue to be a family who owns a business. You certainly could sell the business and have a less complicated relationship with your family members. For some people their reason is to continue a previous generation’s legacy. Dig deeper. Why are you continuing their legacy. What is it about the legacy that drives you to move forward as a family business instead of selling the business. Every generation needs to decide what their legacy is. One of my clients, a fourth generation family business, continues to own the family business because they love giving entrepreneurial opportunities to their family. For them, continuing to own the family business is the best way to continue to give those opportunities. The second question is what are we trying to create that will be here in 100 years? For some people this could be a wing in a hospital, a new school, generational wealth, healthy families, jobs or recognition for the work of the family. Just like the first question, it is important for each generation to be clear about what they are creating that will be here in 100 years. Previous generations had their own ideas of their legacy. I encourage you not to simply adopt the legacy of a previous generation which is a common trap. Look at this for yourselves. The same client of mine wants to create good jobs in Minnesota. When you put the answers to these two questions together they are a clear statement of your legacy. When my client puts the answers to these two questions together their legacy is to create entrepreneurial opportunities for the family and good jobs in Minnesota. Another Minnesota family business states their legacy as creating generational wealth so the family can serve their church, community and future generations. When you know what your legacy is, it becomes more clear who should own the business in the next generation, which family members should work in the business, what kind of growth expectations you should have of the business and how you should make decisions as an ownership team. Schedule a three hour meeting with your fellow owners and answer the two questions. Share the answers with your advisers such as your CPA, financial advisor and lawyers. An owner’s job in a family business is to maximize opportunity and minimize risk for the family and the business. This is a the most important role in family business and can be complicated when more than one generation has ownership of the business. In order to do this well as an ownership group, it is important to understand your values. They set an expectation for how you make decisions as owners. For some people, defining values can feel like a useless exercise or even too difficult to take on. It is worth doing. The good news is your values are already here. You have been following them for years, sometimes generations. You simply need to discover and define them so you follow them with purpose. What are the stories the founders tell over and over? What key decisions were made to get the business started or keep it going? When everyone is done, put all of the words and phrases you heard on a whiteboard. You will notice themes and be able to group them together into 3-5 themes. These are your values. Use them when making decisions about ownership issues such as who can be a future owner, how your ownership is structured, what kind of growth you expect from your business and how you make decisions. Here is an example of how discovering and defining your values helps make important decisions that minimize risk and maximize opportunity for the family and business. Before doing this values exercise they wanted to gift the business to their three children. They thought each of their kids could share equal ownership of the family business. After defining their values they saw that gifting the business did not align with their values. They also realized that since only one of their kids ran the business and the other two not only didn’t run it but didn’t work in it, it could easily fracture the family. They saw clearly that the best decision for their family business was to sell it to one of their children, gift some of the proceeds to each child and create a fund that their children, grandchildren and future generations could borrow from to build their own businesses or create opportunities for others. Their ownership decision sets the next generation up to work for themselves, take calculated risks, build something from nothing, work hard and create opportunities for others. I challenge you to discover and define your values so you can maximize opportunity and minimize risk for your family and business. Schedule 3 hours with the owners of your family business and discover and define your values. Read this great article about values https://hbr.org/2002/07/make-your-values-mean-something . While it is focused on the values of a business, it gives some important guidelines for what to avoid when you identify your values. Take a look at your estate plan, buy-sell agreement and other legal documents. Realign them with your values. Email me at sara@familybusinessmn.com - I’m happy to help you discover and define your values so you can maximize opportunity and minimize risk for your business and family. Transitioning your business from one generation to the next takes an average of eight years. Answering the following questions as an ownership team improves the chances of your family business succession going well. Answer these questions based on your ownership structure and legacy - not the day-to-day leadership of the business. What are the ownership group’s values? These values help guide the decisions you make as an ownership group. If you look at the story of how the business was founded you will often see the values of the ownership team. What will things be like in ten years? As an ownership group it is important to understand who will be running the business day to day, how the founder will be spending their time and who will have ownership of the business. What is your ownership philosophy? There are several questions that are part of your ownership philosophy. The answers to these questions should align with your values and the legacy you’re building. ● Do you have requirements for family members to work in the business? Do they need a certain level of training or education? Do they need to work elsewhere before they work in the family business? Do they need to get a promotion at another business before joining the family business? ● What is your ownership approach to growth and profit? Are you aggressive about growth or not? Do you have certain expectations for profit? Do you expect distributions for owners? Do you expect profits to be invested in the business? What do we need to solve to make sure this is all true? All families, businesses and ownership groups have issues they need to solve. Write them down and find a systematic way to work through them. Answering these questions as an ownership group typically takes two full days of discussion and debate. Some ownership groups can do this on their own, others need the help of an outside facilitator. When you’re the leader of a family business you make regular decisions that can have a huge effect on your business and family. You’re often faced with competing priorities. This simple concept can help you make better decisions for your family business, maximize opportunities and minimize risk for your business and your family. 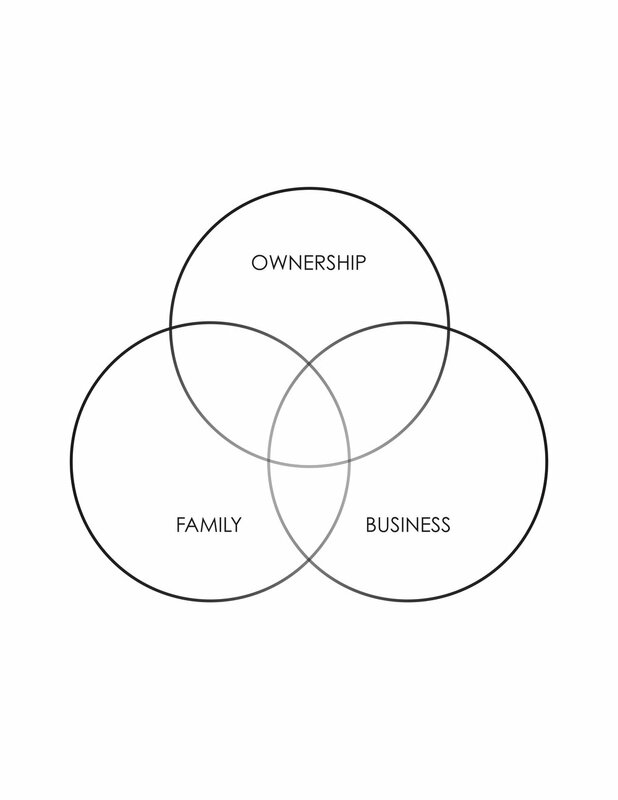 The family and business are obvious parts of this model but an often overlooked aspect is the role ownership plays. The leader in each circle of this model has an important role. The role of the family is to keep the family strong and healthy. The leader in this circle is often responsible for family traditions, reminding people to stop talking about the business at family events. I often refer to the leader of the family as the Chief Emotional Officer. The role of the leader of the business is to run the business according to the wishes of the ownership group. In the healthiest family businesses, this person needs to run a professional business where no one is guaranteed a job. This person's title is often president, CEO or general manager. The role of the leader of the ownership group is to make sure that opportunities are maximized for the family and the business and that risk is minimized for both. This can include bringing on a board, making sure there is ample insurance, ensuring that the right person runs the business and making sure that the needs of the family are understood and met. This leader is sometimes the head of the family council or a person chosen by the family to lead the owners. When you get clear about the kind of decision you're making, you will make better decisions.